Top speed of 65 mph engine typedrivetrain: Air-cooled,over-head-valve, 2-cylinder displacement 499 cc power rating 25 hp transmission 4-speed manual chassis: Pressed-steel monocoque; Worm-and-sector steering; Front independent suspension by transverse leaf spring and wishbone; Independent rear suspension by coil spring and swing arm; 4-wheel drum brakes; 1,166 lbs. 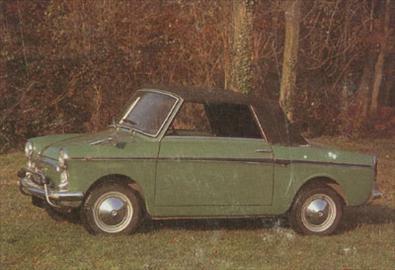 The fiat-pirelli connection in 1955, fiat and pirelli formed a joint-venture company called autobianchi to bring bianchi cars back into production. The first bianchina car left the production line in 1957. Based on the fiat nuova 500, it had two-seater coupe bodywork and was instantly popular. More than 11,000 cars were sold in the first year of production. Additional versions including a cabriolet followed the bianchina coupe into the marketplace. early speed demon for the new cabriolet model, the power output was increased from 20 to 25 hp by raising the compression and fitting a different carburetor, which enabled the cabriolet to reach a heady 65 mph. Like the original coupe, the bianchina cabriolet was quite popular. In 1962, the two-seat coupe gave way to the 2+2 berlina, and in 1970, bianchina productionceased altogether.